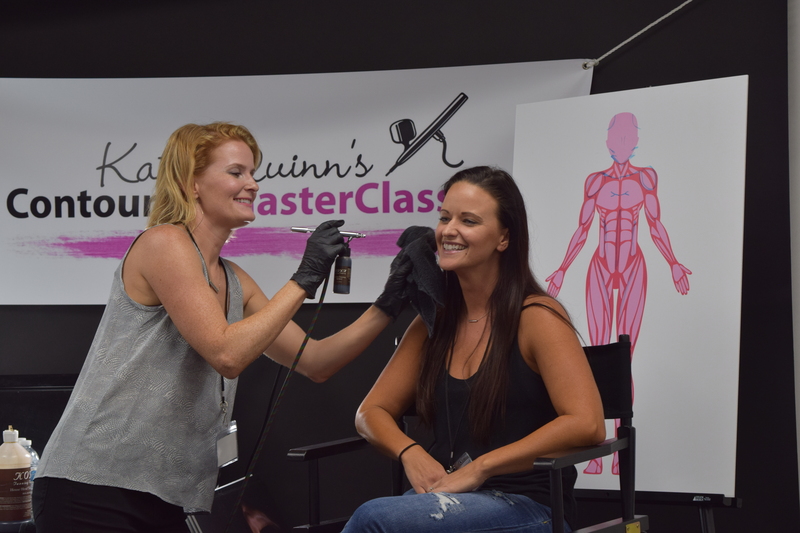 Katie Quinn's Spray Tan Contouring MasterClass - Orange County, California | Learn How To Airbrush Contour | Katie Quinn Spray Tan Central: Contouring, Training, Videos & More! 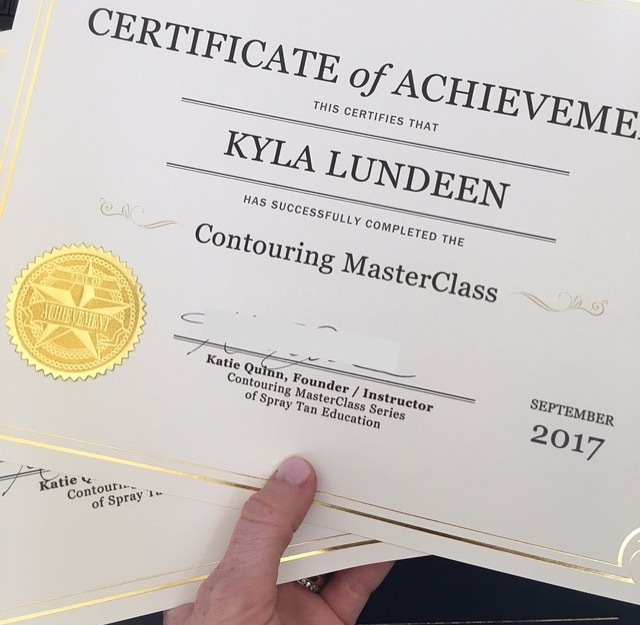 Contouring MasterClass is a one-day seminar where I introduce you to, and take you STEP BY STEP through the SAME contouring magic that I use on celebrities, supermodels, and my everyday clients! Through live watch & learn tutorials, you will gain an extensive knowledge of professional airbrush contouring, including seeing THREE live step by step full body demonstrations, artist tips & tricks, industry standards & secrets, and much, much more. Hands down, adding contouring to my spray tans COMPLETELY changed the clientele that I attract and was the single best thing that I ever did for my business! ANYONE who is looking to charge a premium for their spray tan sessions, or work with celebrities NEEDS to learn how to contour as soon as possible! I had the idea of bringing contouring into spray tans while tanning some of my clients who are fitness models and athletes. I knew we could do more with tanning than just base tans…and my clients were VERY interested in helping me explore this. Together, we dialed in which muscles should be emphasized, where we should be seeing peaks and valleys, how to isolate each muscle for the best view possible, and how to build proportional balance to achieve the overall shape we want. I took this approach to fashion shows and red carpet events, and my clients and I became obsessed with it. Once they saw the results, they were blown away, and my contouring technique became a necessity for ALL future appearances and shoots. This was the beginning of having the UNDYING LOYALTY of my clients. I’ve done the hard work, perfected on the pros, and KNOW WHAT WORKS. I’ve run into every contouring challenge you can think of, and I have already found the RIGHT solutions for each and every one of them. YOU don’t have to start from scratch to upgrade your business FOREVER, and stand out from the crowd. For the price of just a handful of spray tans, you could continue to profit for the rest of your spray tanning career! Give yourself the ADVANTAGE, so clients tan with YOU over them! Invest in yourself! How to apply head-to-toe contouring, identify hidden contours, add proportional balance, how to avoid over-application, how to work with muscle flow and muscle groups, minimization techniques, enhancement techniques, dabbing for contoured looks, and more. Includes THREE LIVE DEMONSTRATIONS. – How to make big bucks in the bridal business: Pricing, trials, referrals, packages and more. – How I travel with my tanning kit; packing tips & tricks! YOU’RE GOING TO LEARN SO MUCH – THERE ARE TOO MANY THINGS TO LIST THEM ALL HERE! You will leave with all kinds of new tanning methods, tricks and knowledge, but most importantly you will understand CONTOURING.